I don't think I missed it, so where is it? Well, I found this: "Over at Playstation.com, you can now get your hands on a UMD demo of Gangs Of London for the PSP! Just get all registered up, and a demo of the game will be making it's way to you - while stocks last of course." Get all registered up for what? The demo? The entire site, what??!! Well, it looks like they're all out anyway. Long story short and all. Cheese. 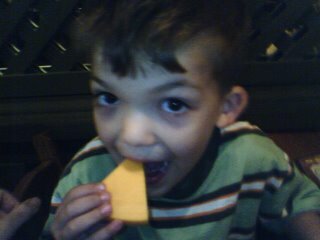 As you recall from our May post, Aaron is willing to love things for a price. This month, Wisconsin is sponsoring us. 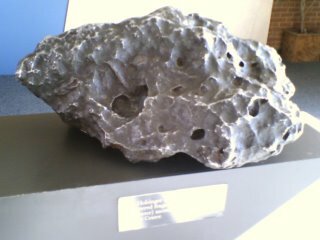 This is the largest recovered part of the Winslow, AZ meteor. Seperated at birth from the Cinnamon roll? Available at Lulu's Bakery and Cafe at 918 N Main in San Antonio, TX. 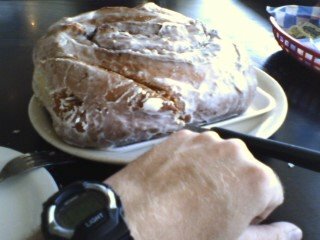 (Not the meteorite, the cinnamon roll. The meteorite is from..oh never mind.) I gotta be honest here folks, the one I had on Sunday was a little dry, but I think that's because they cooked it too long. They've been excellent in the past so we'll say everyone has an off day. But the caramel-y crust on the bottom was a plus and a hint it was in the oven too long. Pop a slice in the microwave with some extra icing from Lulu (at $1) and a little Betty Crocker Cream Cheese cake icing, and look out. I got one to work on there, and one to take home. They weigh 3 pounds and cost $3.99. How can you go wrong? The photo is a little deceptive. They are about the size of a small child's head. That is, unless your child has a huge head, and you know who you are. I've seen some planetoids out there. See how we came full circle? Meteorite->Cinnamon Roll->Planetoid. Works for me. It's called writin'.